I have been reloading now for going on two years but only started casting my own bullets a little over a month ago. It's really a hobbie in itself, but goes hand in hand with reloading your own. A few years ago I never would have thought I would be casting my own bullets, but I didnt think I would be doing alot of things I do now. I have always been into firearms since my teens but being on the internet and a member of a couple forums and one in particular Paco Kelly's Leverguns I have met and talked to some very knowledgable and kind folks with the same interests as me. And made some good friends along the way. Anyway it all leads me to the point where I am now. Shooting my very first hanloaded cast bullets!!! I was setting up the chronograph and the anticipation was intense to say the least. Several days ago I loaded my first cast bullets a Lee 429-200-Rn dropped from the mold right at 208 Gr. I had gotten 16lbs of surplus powder and it was time to use some of it. I started off 10% below start charge out of the Lee Modern Reloading Manual for the simple fact I dont know the quickness of this powder but followed AA#9 data as instructed. When I first pulled the trigger on my Rossi I felt just like I did when I began handloading a couple years earlier. My Fun Meter Was Pegged, and the sense of satisfaction was intense. Of course I was just happy they went bang! I knew from a fellow forum member that I probably didnt have the correct bullet powder combo due to the WC820(n) needing more chamber pressure to burn effectivly( Thanks Junior) But I had already loaded these and just couldnt help myself, and if there was any leading from the bullet not having enough lube. After I was done shooting I examined the bore and sure enough there was leading a couple inches from the muzzle and about halfway through the barrel as well. Lube failure was evident as was unburnt powder and residue from a light charge. I was told this would be the case with my bullet and powder weight combination but wanted to try anyway to give me an idea what barrel leading looks like and to give me some experience etc,etc,. Heres a pict that shows the lead deposits in the bore. 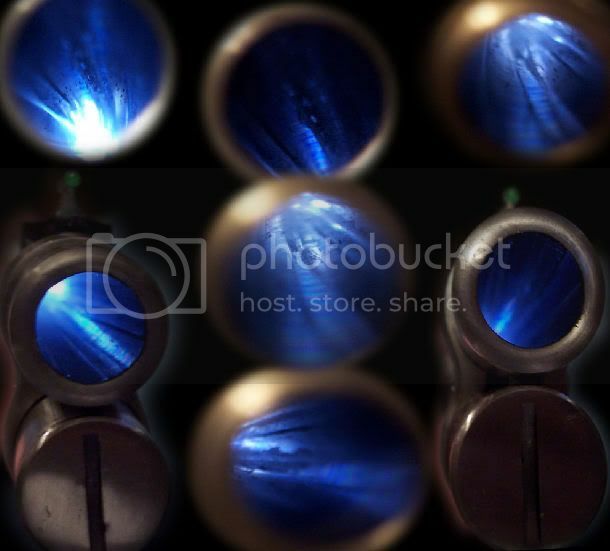 Another thing is I really didnt know what leading in the bore looks like because I have always shot jacketed bullets in my pistols and rifles. Like I said this is all new to me. But you have to start somewhere.....To Be Continued.